Work on the trailhead parking area on Oct 22, 2018. The area will be closed (including the trailhead) until work is completed. There will also be work on the shoulder of the road. Reconstruction will include increasing the number of available parking spaces from 18 to 42, improving traffic flow, and improving associated trailhead facilities and signage. The reconstruction and closure period is expected to last through late April or early May of 2019, due to weather conditions and the resulting construction delays. There is a connector trail from Juan Tabo Picnic Area that will allow access to the La Luz Trailhead. Thank you to volunteers from Friends of the Sandia Mountains for their help in building and formalizing this connector trail. Also, the public may continue to access the La Luz Trail via the Piedra Lisa-La Luz Link Trail (#137C, starting at the Piedra Lisa trailhead). 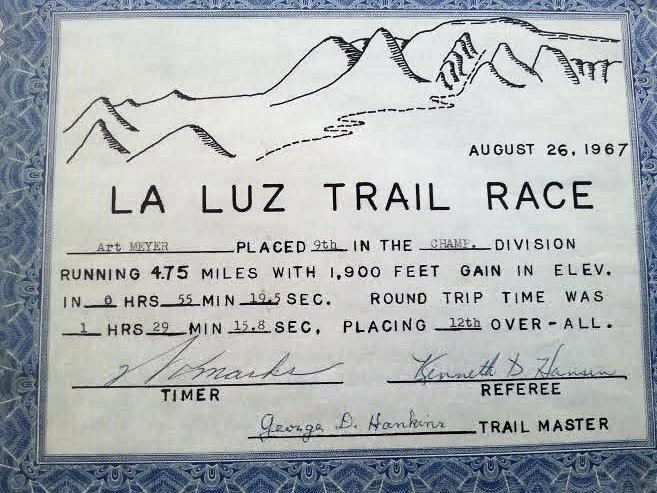 La Luz Trail Run is a nine mile trail race that starts in the foothills of the Sandia Mountains in Albuquerque and finishes at Sandia Crest at an altitude of 10,678’. This is over 4,000’ of elevation climb. We use a lottery system to fill the 400 allotted slots in the race. The 400 limit is mandated by the United States Forest Service (since much of the race is run through National Forest that has been designated as a Wilderness Area). The lottery process is open during the first two weeks of May on Ultrasignup.com. After the lottery has closed, Ultrasignup will randomly draw all names and compile a list. The first 400 names selected will be entered into the race, charged the registration fee, and notified of their entry. Those not selected in the first 400 will be placed on a waiting list in the same order as their names were randomly drawn. As cancellations are received from the original list of 400 entrants, persons from the waiting list (in order) will then be offered an entry slot. If the slot is accepted, racer will be charged and added into the race. Racers will not be charged until selected AND notified by email. Bib numbers/race entries are not transferable. Finish times for unauthorized runners will be discarded = disqualification. There is no race day registration and no refund or rollover of entry fees for any reason. Please understand that ARR is a non-profit, all-volunteer organization, and only non-profit groups benefit from this race. The race will start promptly at 7 am sharp! You must complete the race in 5 hours or less to be an Official Finisher. The registration fee is $45.00 for members of the Albuquerque Road Runner Club and $55.00 for non-members. This fee will be collected by ultrasignup.com at the time of race admission. Prizes awarded to First Place Overall Male & Female and First Place Overall Masters Male & Female finishers. Age group awards in the following age divisions (1st, 2nd, and 3rd place male and female): 01-15, 16-19, 20-24, 25-29, 30-34, 35-39, 40-44, 45-49, 50-54, 55-59, 60-64, 65-69, 70-74, and 75-up. The course consists of 1.8 miles of paved road and 7.2 miles of dirt single track trail with a ~12% grade. All runners must stay on the trail – no shortcuts are permitted. For your safety, please refrain from wearing any electronic devices in your ears or using any other electronic devices and yield to faster runners on the course. No pets or strollers are permitted on the course. Parking is allowed only on the shoulder of Tramway Blvd – no parking will be allowed on Forest Road 333. The starting line is ~0.5 miles up Forest Road 333 from the turnoff from Tramway Road onto Forest Road 333. Allow extra time to get from your car to the Start Line. Porta-Potties will be provided at the start, but will not be available along the rest of the course. There are permanent Forest Service restroom facilities at the finish area. At the “Y” about 0.5 miles before the finish line, you will turn left on Crest Spur Trail, which will take you to the finish line. There will also be a water aid station at the “Y”. The finish line is on the Crest of the Sandia Mountains – just to the south of the Gift Shop building at the termination of the Crest Highway on top of the mountain. A $3.00 parking fee will be required in the parking lot at the finish line. A National Park pass or Sandia District pass may be displayed to park in the finish line parking lot. Shirts will be distributed at the Finish Line to Official Finishers. Your race number is required to pick up your Finisher's shirt. 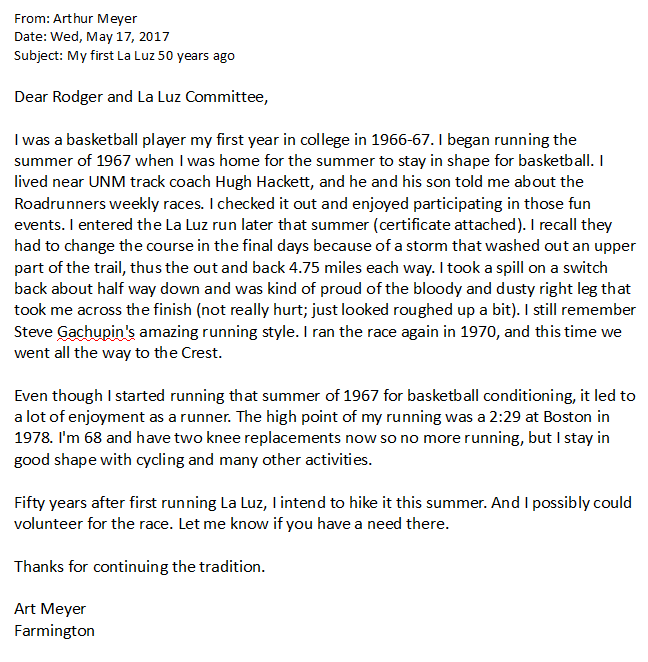 The La Luz Trail Run has been sponsored by the Albuquerque Road Runners Club since 1999. Thank you for your continued support of the race and a big Thank You to all the Club volunteers, Ham Radio Operators, and the Scout Troop that handles the two middle aid stations. 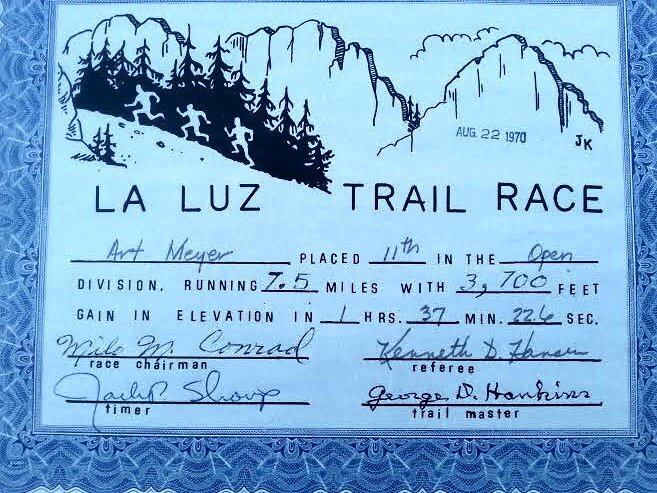 In the Fall 2001 issue of Trail Runner Magazine, La Luz was selected as one of the "12 Most Grueling Trail Races in North America." A portion of race proceeds is donated to Scout Troop #17 for their volunteer efforts at the La Luz Trail Run. 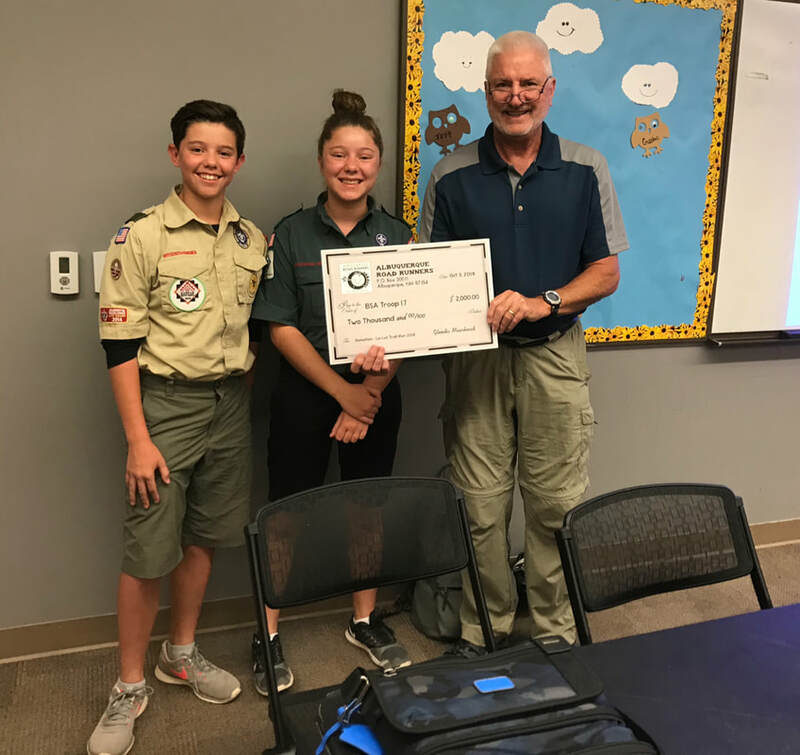 Luz Race Race Director Rodger Sack presents a check to representatives of Scout Troop 17 at the October 2018 membership meeting. The scouts were instrumental in the operation of the middle two aid stations of the race, including transport of umpteen loads of water up the trail, staffing the stations, and removing all trash.